A compressed spring is a type of spring that produces linear force. The force is produced when a weight is applied to either the top or bottom of the spring. There are many variations of a compressed spring such a conical compressed spring, variable pitch compressed spring, and barrel compressed spring. Each spring produces force in a unique way within your design. 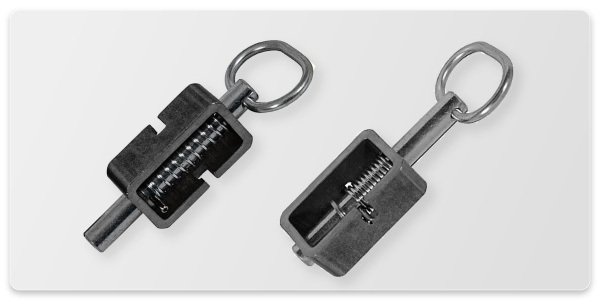 When using a compressed spring in your application make sure you are designing your spring to get the greatest amount of force in the most economical way. 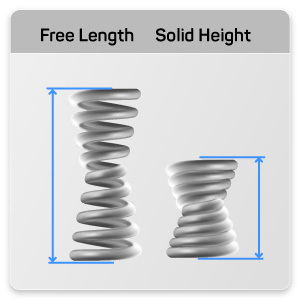 A compressed spring may travel all the way to solid height, meaning all coils are touching, or may only be able to travel a restricted amount of force due to stress and other factors. When designing your compressed spring make sure it can safely travel to solid height if you need it to do so. 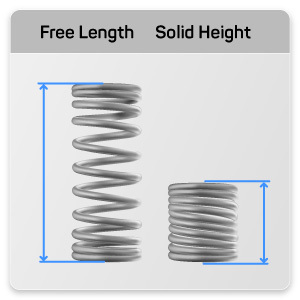 The easiest way to determine if your spring can safely travel to solid height is by using our compression spring calculator. Acxess Spring is a specialist in the manufacturing of compressed spring. We manufacture compressed spring in a variety of different wire diameters, outer diameters, and free lengths. Our manufacturing capabilities for normal compressed springs are from 0.006 inch wire diameter to 1.250 inch wire diameter. Any of our regular compression springs can be manufactured with variable pitch. 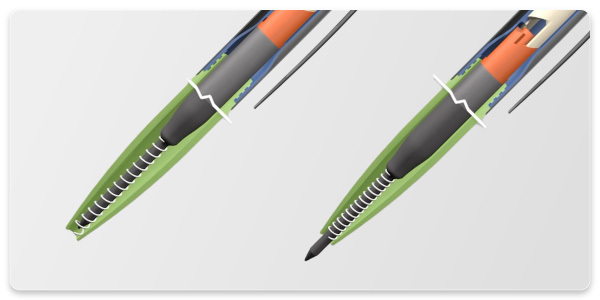 On the tapered compression springs we can manufacture within a wire diameter of 0.006 inches to 0.100 inches. Please see our services page for a complete list of Acxess Spring services. Acxess Spring has the capabilities to manufacture from one spring to millions. We are here from prototype to production. If you would like to purchase a compressed spring from Acxess Spring please fill out the quick quote to your right. Compressed springs can work in a variety of applications. It would be most beneficial for you to use a compressed spring in an application where you need to produce force linearly when the spring is moving from fully extended to compressed. If you need to produce linear force in a pulling direction you will need to use and extension spring. For example, if you have a motor that is moving the arm of the apparatus in a counter clockwise direction and Every time the arm of the apparatus makes a circle it pushes up against the spring and causes it to compress. The compressed spring will then produce linear force again an object, which in turn will allow the application to function properly. It is very important to correctly determine the amount of force a spring needs to generate in order to achieve your intended goal. For example in the animation to the right, if the spring was too strong the arm would not be able to compress the spring when it rotates and the application would not function. Equally if the spring was too weak, the arm would compress the spring completely and generate weaker linear force than is needed and the application would not work correctly. To see more information on calculating the proper strength of your compressed spring please see our compression spring technical page. 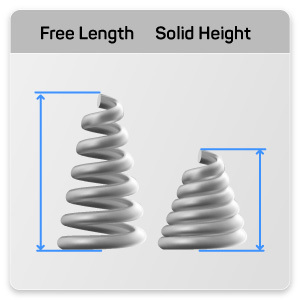 The image to the right shows a very common example of a compressed spring working all the way to solid height. Solid height for compression springs is defined as the point at which all wires in your spring are touching and no more force can be exerted by the spring. Solid height plays are crucial role in compression spring design. Force the application to the right to function the force of someone's finger needs to compress the spring all the way to solid height, which causes the tip of the pen to click out of the opening at the top. Similarly the person will force the spring to solid height again releasing the clasp and allowing the tip of the pen to be placed back inside the opening.